A set of four armchairs and two bergères with a decorative silk upholstery. 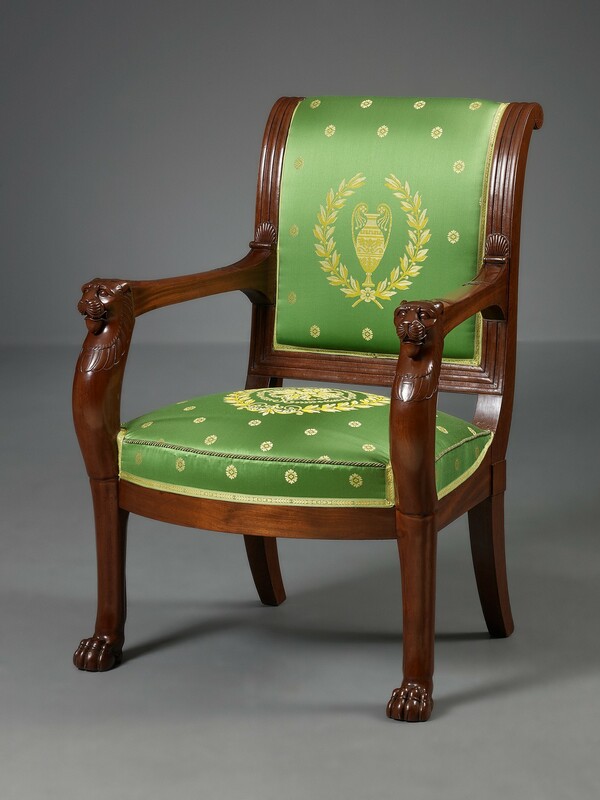 The armchairs of neoclassical design are made of solid mahogany and mahogany veneer. The front uprights have carved lions paws at the base and carved feline heads at the top. The back legs are slightly raked. 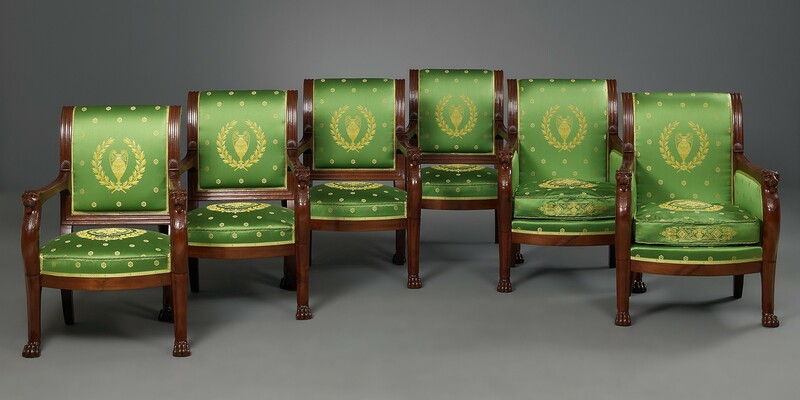 The back uprights carry three channels of fluting and carved shell-shaped ornamentations just above the armrests. The seat rails are mostly of rectangular section and plain. The bergères are of similar construction and decoration and have matching upholstery on the sides. Measurements: Armchairs; height 96 cm; width 67 cm; depth 67 cm. Bergères; height 96 cm; width 75 cm; depth 75 cm. Compared to the earlier periods, the Neoclassical style is featured by less curvy shapes and more rectilinear designs. 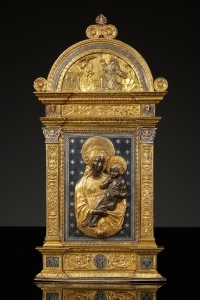 Also, there is less abundance in gilt bronze decorations. The Directoire style, that develops during the first years of the First French Republic is not an independent entity, but rather a transitional phenomenon. The architectural ideas and ornamental decorations are derived from the classical antiquity and inspired by the works of, amongst others, Charles Percier (1764-1838) and Pierre-François-Léonard Fontaine (1762-1853) and anticipate on the Empire style that develops during the First French Empire. Also the work of the painter Jacques-Louis David (1748-1825) was of great influence for the decorative arts in the Directoire period and subsequently the Empire style. 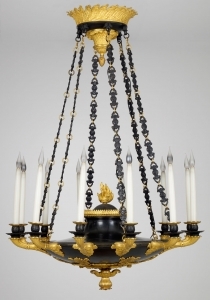 When Napoleon comes to power he evidently influences the style of interior design and decorative arts. Around 1803 the Empire style develops, demonstrating a taste for massive and imposing elements. Inspiration is derived from military campaigns – notably to Egypt – and martial attributes that are used as decorative elements. The British Blockade, that started in 1806, forced furniture makers to substitute exotic wood species with native material like walnut, maple, lime, and ash. A much preferred material, however, is mahogany. The style is characterized by its severe straight lines and strictly orthogonal design. Furthermore the absence of marquetery and the use of sphinxes, lions, dolphins, swans, bees, and “Renommées” – winged mythical creatures – as decorative elements characterize the Empire style. Over a period of 80 years the Jacob dynasty produced chairs and furniture of an outstanding quality. In 1765 Georges Jacob (1739-1814) founded his company in Paris, after he had been appointed maître menuisier. Two of his sons, Georges II and François-Honoré-Georges, took over the company when he retired in 1796. When Georges II dies in 1803, their father returns from retirement to develop the business on the rue Meslee to what would become one of the largest furniture workshops in the Napoleonic era in Paris. Later, in 1825, Georges Jacob’s grandson Georges-Alphonse Jacob-Desmalter continued the company until the reign of Louis-Philippe. In 1847 George-Alphonse ended the company and dedicated himself to architecture. 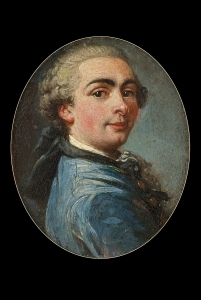 The brothers Georges II Jacob (1768-1803) and François-Honoré-Georges Jacob-Desmalter (1770-1841) ran one of the most successful and influential furniture workshops in Paris. 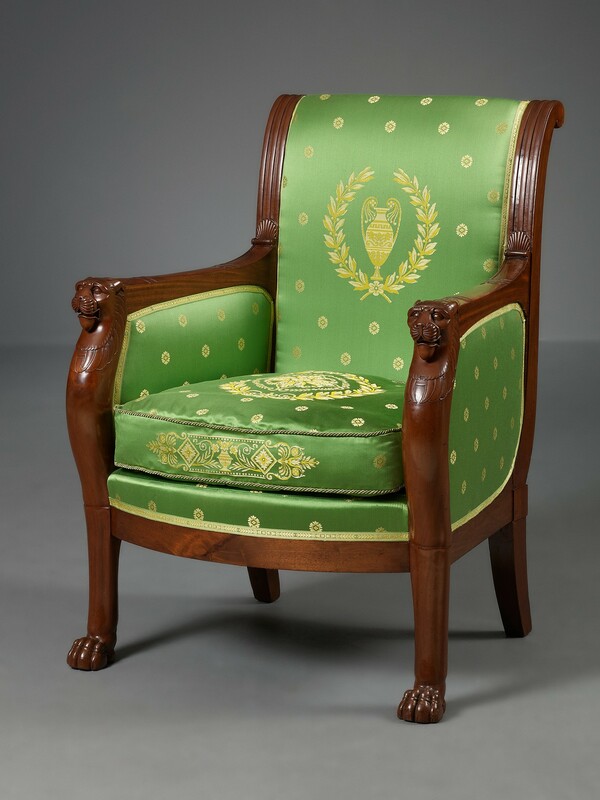 Whereas Georges I Jacob mainly produced seating (menuisierie) in early Neoclassical style, his sons, freed from the restrictions of the corporation system, that was overturned in the Revolution, also produced veneered case-pieces (ébénisterie).